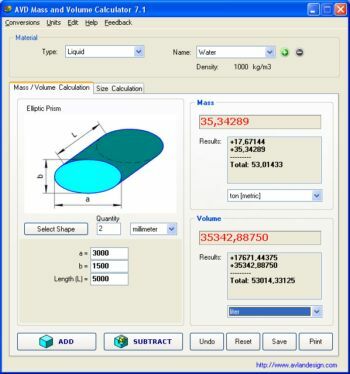 AVD Mass and Volume Calculator is the most universal solution for complex mathematical calculations working out weight, volume and mass of a given 3-D object. You can choose the shapes from a wide list of geometrical figures and combine them to create composite objects, including the ones that have apertures. The tool takes into account objects density, supports a variety of units, features a unit converter and saves collected results to a text. ...... physical parameters of objects of most diverse shapes. The program includes such structural units as: plate, pipe, bar, beam, channel, angle and others. Calculate volume and mass of 3-D objects. Qweas is providing links to AVD Mass and Volume Calculator 8.0 as a courtesy, and makes no representations regarding AVD Mass and Volume Calculator or any other applications or any information related thereto. Any questions, complaints or claims regarding this application AVD Mass and Volume Calculator 8.0 must be directed to the appropriate software vendor. You may click the publisher link of AVD Mass and Volume Calculator on the top of this page to get more details about the vendor.